Spring break was the last time I fished for trout and that was almost a month ago now. This was a problem that needed to be corrected so I finally made it up to the Hiwassee. The river should be turning on really well with big hatches of Hendricksons and a few BWOs along with the usual caddis and I wanted to see how things were coming. The desire to fish dry flies was strong, so strong in fact that when I arrived and only saw a few stray bugs, I tied on a Neversink Caddis in dark brown with a caddis-olive softhackle as a dropper. The first few casts gave me a rise to the softhackle, but after several more I knew that the fish wouldn't be tearing up the dry. Accordingly, I tied on my early season go-to fly on the Hiwassee, a #16 beadhead black simi seal leech pattern which apparently does a good job imitating all the small dark stonefly nymphs that are active this time of year. This proved to be the ticket and I started hooking fish. Not tearing them up mind you but catching one here and one there at a decent pace. Since I don't have any great stories to tell, I'm going to send you over to Hugh Hartsell's page. 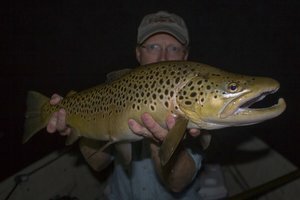 Hugh is an excellent East Tennessee guide and recently posted a report about catching a very nice brown trout over on the South Holston...pictures included... Check it out! That's basically what's been going on with me in the realm of fishing. I've been swamped with school-related stuff for the last several days and it looks like things aren't going to get any better until late Wednesday (big test that afternoon). Thursday looks to be a good day to fish though so I'll probably be heading out to either the HI or maybe the Tennessee River again. The next couple of weekends WILL include some type of fishing and most likely trout unless it rains a lot and the rivers/streams are all blown out. Anyway, check back soon in the next few days as spring has arrived in East Tennessee, and I'll be out there trying to make the most of it. While fishing on Thursday, I was able to enlighten a kid that stopped by to watch my buddy and me fish. When he first came up, he asked if I had caught any fish. I replied in the affirmative and added that I had caught several. What happened next cracked me up but also showed me the general mentality that people have about fishing. The poor kid looked all over for those fish and then asked, "Where are they?" If you can imagine the confusion on his face when he didn't see any fish laying around, then double that confusion to imagine his face when I said, "I let them all go." I wanted to have a good chuckle, but since this was a good teaching opportunity I resisted. Three or four minutes later, I hooked up on one of my better fish of the day. He watched me fight the fish and then land it and quickly asked if he could have it. I reminded him that I let all my fish go and he seemed fine with that but wanted to hold the fish. Of course this was okay and so he spent a little while admiring the fish and my buddy snapped a quick picture for me and we let it go. Hopefully that kid will remember that you don't have to keep 'em all. Things have been heating up here in the Tennessee Valley, both the weather and the fishing. This past Thursday brought on the best fishing I've head yet on the Tennessee River for the bass (white, hybrid, yellow). Right now, large schools of baitfish are finally showing up and the fish are having a heyday feasting on them. For those that fish in Tennessee, you know that your license comes from the Tennessee Wildlife Resources Agency (TWRA). 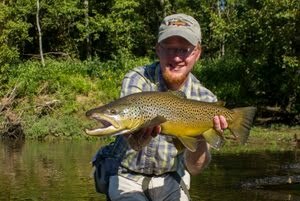 It has been brought to my attention via the Little River Outfitter Message Board that Rep. Sherry Jones (D - Nashville) is sponsoring a bill (House Bill 2856) that would abolish TWRA and also would deposit all funds from license sales into the general fund instead of directly back towards enhancing and protecting our waterways and wild areas. Additionally, the state would lose millions of dollars in federal funding that are currently going to TWRA. This plan is a disaster and I would strongly encourage you to email or call your representative and let them know that you are against it. You can find your representative here. This bill is currently nowhere near a general vote and probably won't get that far as it must go through committees first. Regardless, this is an important issue so let your voice be heard. Once again, I have added some links so check them out when you get a chance. The two most recent are the Key West Tarpon Fishing Guide and the Fly Fishing Community. The most recent water supply forecasts are out from the National Water and Climate Center and across the west, snowfall has been generally near to well-above average. 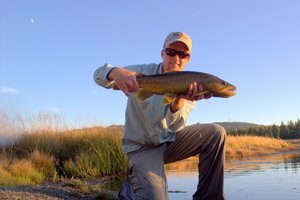 This year should be great for fishing throughout the Rockies. I'm starting to work on figuring out how to have another trip to Colorado this year...wish me luck! Days where you seem to catch fish every cast are a lot of fun albeit unrealistic. Yes, it usually takes at least some type of skill to have great days even when the fish are "on." However, it is the slow days that really show you where you are at. March has started out tough for me. On Monday, the 3rd, I took a quick trip to the Smokies. I had a tough time bringing a couple of fish to hand on nymphs. One of my problems seems to have been that I fished Abrams creek for awhile in the afternoon. It probably would have been better to stick to Little River. The water I covered on Abrams apparently had already been fished through earlier in the day (which I naturally didn't find out until after the fact) which made things very tough. Then again, it just seemed like one of those days where things aren't working well for me. It happened again yesterday. A buddy and I went up to Upper East Tennessee to fish the South Holston and Watauga. Unfortunately, both rivers were still suffering the effects of the recent heavy rains and where anywhere from stained to muddy depending on where you were fishing in relation to the dams. 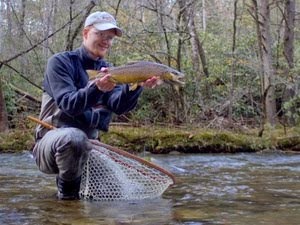 On the South Holston, the fish were feeding heavily but it didn't seem to make any difference. 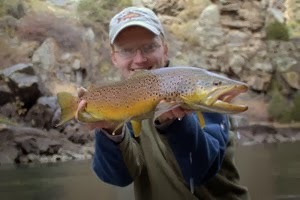 I only managed a couple fish over the course of the day, a small 'bow and a small brown. Well, it was so cold yesterday that I lost a fish...a really nice fish as in a big 18-20 inch trout. Mother nature tricked me though, making me think it was nice out. Seriously, it wasn't all that cold when I started fishing. To celebrate the start of spring break (should be called winter break), I went down to check out the Caney Fork river for a couple of hours. I started out up near the dam with a shad pattern. Despite the dead and dying shad floating lazily along, the fish didn't really seem interested. Oh, and did I mention that it wasn't that cold? In fact, it felt much nicer than I expected. Finally I decided to head downriver and make the switch to smaller flies. The midge hatch seemed to be an all day event. That probably had to do with the cool (not cold, YET) air temps and clouds not to mention that occasional rain and drizzle. The fish were feeding heavily on the small bugs which seemed odd with all the giant meals floating along. Anyway, I made the transition on down the river. After tying on a new leader more suited to fishing midges, I soon made my way down to the water and was soon caught up in the business of landing fish. The fish acted like they were starving. Oh, and it was starting to feel cold out. Then IT happened, the worst thing when your hands start getting cold. My tippet, fly and indicator became horribly tangled. There's only one solution for this disaster and I bravely began the long and tedious process of retying. My left hand was so cold at this point that I couldn't use my thumb and index finger to grasp things much at all. Knot tying became an incredible adventure taking closer to 20 minutes instead of the usual 20 seconds it takes to tie on new tippet AND a fly.